Additionally your current speed, course, altitude and vertical speed are displayed. 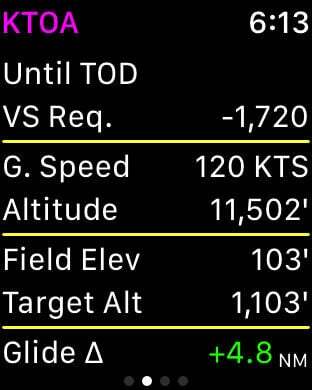 Tapping on the information button, Time to TOD or Target Altitude allows you to customize the desired descent rate. 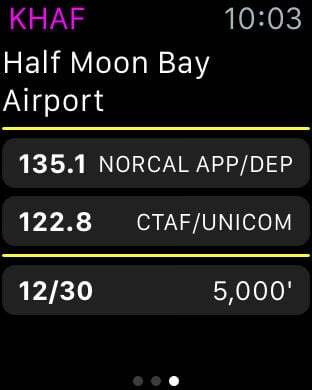 All data is updated in real time as you fly. You may choose a nearby airport or select an airport by identifier by scrolling down on the airport list. Filter by runway length and surface type and choose any of the following: airports, seaplane bases, heliports, balloon ports and closed airports. You may optionally provide a glide ratio for your aircraft. 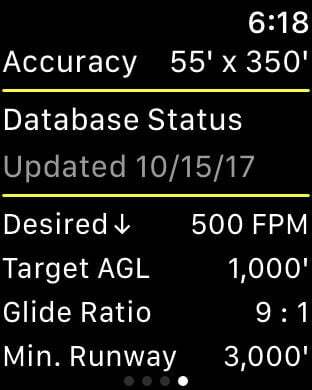 The glide distance long or short of the selected airport is then displayed and is conveniently color coded. A positive, green glide delta indicates the glide distance has been estimated to exceed the distance to the airport with a 25% safety margin. Runway headings, if known, are used to draw runways on the heading indicator. If the magenta arrow is pointed straight up and aligned with a runway then you are headed straight in. Worldwide airport information is provided by multiple sources. Canada, Europe and all continents are covered! For more information go to ourairports.com/world.html. Database updates are performed daily. Your location and altitude is provided by your device's location services. If location or altitude is not available that information will not be displayed however you can still search for an airport by identifier. Unfortunately external GPS devices are generally NOT compatible. You must be moving for course information and the magenta relative bearing arrow to be displayed. The Watch app has many of the same features and fits on your wrist. See distances to nearby airports or bearing to a selected airport. 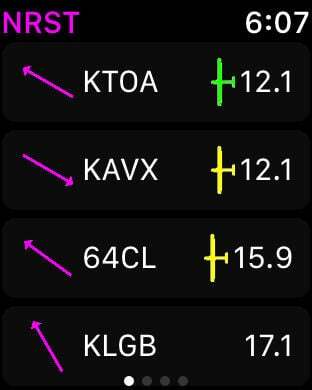 Frequencies and runway lengths can be seen with a swipe. A green glide icon or delta indicates glideability is likely. 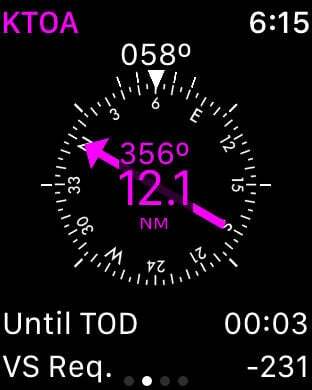 Just like the iPhone and iPad app, the Watch app requires GPS information to locate nearby airports and relative bearing. Additionally, altitude is needed to calculate descent rates. Apple Watch 1, 2, 3 and 4 are supported. Watch 1 requires an iPhone for GPS signal however a Watch 2 has it's own GPS. Feedback and feature requests are appreciated. Thanks!